POWERED HAULAGE 64 E&MJ • JUNE 2018 www.e-mj.com COMPANY PROFILE-PAID ADVERTISEMENT Conveyor Belt Safety The discussion regarding conveyor-re- lated fatalities started with a case in a Kentucky coal mine. Working on the third shift, a belt foreman and a miner were repairing a splice. "They turned off the conveyor, but they did not lock and tag the visual disconnect that provides power to the drive even though they drove past the power center," said Marcus Smith, chief of accident investigations, MSHA's Coal Mine Safety and Health Division. Another miner driving a personnel carrier damaged the electrical control line of the on/off switch while the others were splic- ing the conveyor. He repaired the cable and restarted the belt. The foreman was on top of the belt and was fatally injured. "As we have said for many years, lock- ing and tagging equipment is so important in many situations for both electrical and mechanical work," Smith said. "There are a number of ways to do this properly, such as opening the breaker and locking and tagging the visual disconnect. The person who locks out the disconnect should keep the key with them and not restore power Bel-Ray has been solving lubrication problems since 1946 and has provided high tech min- ing lubricants for more than 50 years, often working with OEM's to develop high perfor- mance lubricant specifications for mining and processing machinery. Bel-Ray products have a reputation for being the best in class when it comes to quality performance and innova- tive technology. The demands of current and next generation mining equipment mandates superior lubricants formulated to ensure the best protection and performance. Bel-Ray lubricants meet and exceed the challenge. For nearly twenty years, Bel-Ray's top tier grease type open gear lubricant, Molylube ® SF-100 Semi-Synthetic Open Gear Lubricant has met and exceeded the most demand- ing applications and OEM specifications. Molylube SF100 Semi-Synthetic Open Gear Lubricant has met dragline and electric rope shovel lubrication challenges ranging from -50°C to +50°C ambient temperature from the tar sands of northern Alberta, Canada to the Atacama Desert of Chile. The value and performance of the product have been proven around the world in the most challenging and harshest environments. 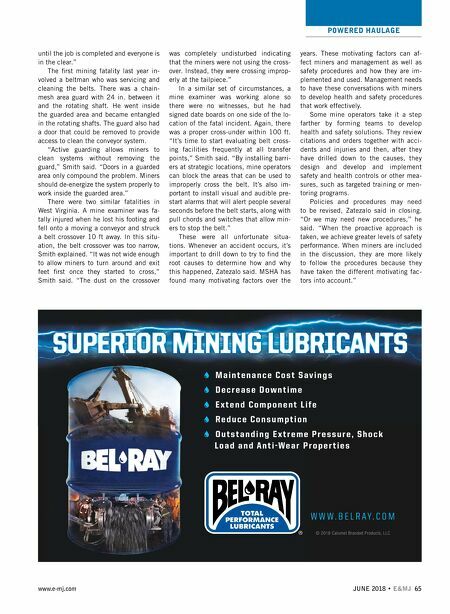 In the effort of continuous improvement and to meet modern demands of key Mining OEM's, Bel-Ray recently introduced Molylube ® Ultra Open Gear Lubricant, the superla- tive open gear lubricant on today's market. Molylube Ultra Open Gear Lubricant is a com- pound type open gear lubricant that meets or exceeds the performance requirements of all major dragline and electric rope shovel man- ufacturers. With high base oil viscosities, in combination with unsurpassed load carrying and anti-wear capabilities, Molylube Ultra Open Gear Lubricant will reduce or elimi- nate scuffing of heavily loaded gear teeth, is multi-functional and is a priming lubricant for pre-lubing gears. Bel-Ray has also developed Clear Gear Lubricant for large open gears used in the process industries in an effort to expand the influence of its open gear lubricant expertise. Clear Gear utilizes complex fluid technologies to ensure that open gear drives on equipment such as ball mills, kilns and dryers are fully protected by the simplest mode of lubrication, hydrodynamic or full fluid film lubrication. Clear Gear provides full fluid film separation of gear teeth, avoiding metal-to-metal asperity contact. If there is no contact there is no wear! Bel-Ray is in a unique position for being able to provide the full spectrum of lubricants for mining and the process industries includ- ing high performance lubricants, gear oil, open gear lubricants, general purpose and specialty greases, 5% aluminum complex and lithium complex EP greases for mobile equipment, hydraulic oils, wire rope lubricants, heavy duty diesel engine oils and thread compounds. Bel-Ray has a lubricant to meet your every need. Visit www.belray.com to learn more! BEL-RAY ® SETS THE GOLD STANDARD FOR MINING LUBRICATION A properly designed conveyor crossover allows miners to exit feet first and a barrier prevents them from crossing at the tailpiece.